Honesty, Courtesy, Integrity, Responsibility, Respect of Ourselves, Respect of Others, and Respecting Authority! It’s laughs, music and life stories to help kids choose the path of integrity! Have Jerry design a school assembly specifically for your school, using pieces that emphasize the character traits your school is currently working on! When we feel the need to bully someone else, we are actually displaying our own insecurities, and covering them up with a show of strength. Though the bully appears to be in charge, he or she is actually locked into a system of control and manipulation, leaving them without the freedom to enjoy life, relationships and the fun of giving and receiving affirmation. For most people, especially children, bullying and showing off do little to make us attractive and isolate us even more from our peers whose affirmation we all need. 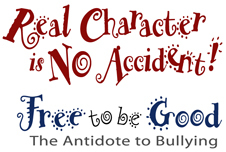 The victim of the bully, often hurt and scared, needs to know that the bully’s message is untrue. They are acceptable as important members of our school community and cannot be defined by a bully. The real winners in life are those who are mature and free enough to affirm their peers. The real test of someone’s maturity is the giving of affirmation to someone who is younger or weaker in some way than ourselves. These lessons learned, there is nowhere to go but up since we are free not only to help and be helped but to know how to choose mature role models and set positive goals. After the introductory opening song featuring 228 names, the show progresses through the above mentioned points using story and song. Please note that the term “bully” is not used as kids know when they’re being preached at and keeping hearts open and positive is the goal. Also note that the feelings of the “bullied” will not be addressed since the bully needs no encouragement that his or her actions can be effective, negative though that effect may be. With over 60 pieces to choose from, repeat customers can always look forward to a brand new character-encouraging show. Junior high students love Jerry’s Junior High: the best 10 years of my life, dealing with peer pressure and the sequel Hot Dogs on a Nervous Stomach which deals with decision making skills, accepting reality and getting help leads to a healthier and happier life.